Without trying that hard, Bohol gets free promotions, all for doing what needs to be done. The recent citation as the Most Business Friendly Local Government Unity (LGU) and the recent move to have United Nations Educational Scientific and Cultural Organization (UNESCO) declare Bohol as a global geo-park, goes a long way to propel Bohol to new heights, said Governor Edgar Chatto during the launching of the global geo-park in Carmen. The governor spoke on the context of Bohol’s drive to attract more tourists and investments by assuring a balance kept between investments and in preserving the environment. 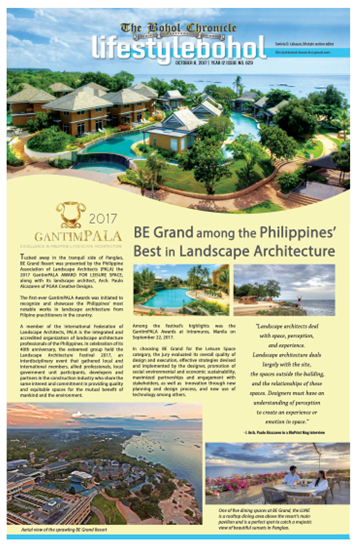 It may be recalled that the Philippine Chamber of Commerce and Industry (PCCI) conferred to Bohol the Most Business Friendly LGU, a first but nevertheless, a source of pride, Chatto emphasized. Emerging first among the top 14 finalists from a shortlist of 81 local government units, Bohol basked in the limelight when the PCCI through President Rodrigo Roa Duterte handed the award to the province in fitting rites at the Manila Hotel recently. 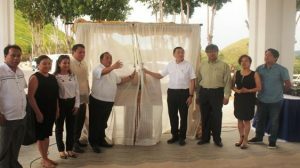 The PCCI saw how Bohol keeps in place an environment conducive to business growth. Bohol was among the local government units (LGUs), including cities and municipalities showing outstanding efforts in instituting trade and investment promotions, transparency, accountability and efficiency in delivering business services to the community. Judging was done according to local initiatives in trade, investments, tourism promotions; forging public-private partnership; support in the over-all development of micro, small and medium enterprise (MSME); setting up of a quality management system and its innovations, as well as local human resource development and inter-local government relation, according to Capitol sources. Recently too, the University of the Philippines School of Urban and Regional Planning (UP-SUPR) whose leaders are looking for a pilot site in the country to be declared a geo park, didn’t look further but peeked through Bohol. UP-SURP dean Professor Mario delos Reyes revealed the plan to declare the country’s first and only global geo-park during the launching of the Aspiring Bohol Global Geo-park, October 15 at the Chocolate Hills. Prof. delos Reyes shared that they have been assessing and evaluating the country’s geo-parks but could not be totally convinced of picking one. Delos Reyes was with retired scientist and professor Dr. Emeritus Gero Hillmer as well as geologist Nancy Aguda in evaluating the country’s parks. The UP SURP dean narrated that they have been to Palawan underground river, the Ilocos Sand dunes and the Taal seascape, but they knew it was Bohol. When other geo-parks are for sites, Bohol’s attempt would be for the whole Bohol which would keep its geo-sites protected. UP SURP named Hinagdanan Cave, Maribojoc Uplift, Inabanga Wall and the Chocolate Hills as reasons for its geo-park application. It did not name the Danahon Double Barrier Reef. When included in the geo-park list, Bohol would be placed under the Global Geo-Parks Network and be supported by the UNESCO and should be helping Bohol its geological structures that are already here.